What kinds of plants can I identify? The Go Botany Simple Key helps you identify thousands of native and naturalized plant species in New England. You can also identify subspecies and varieties. Many of these plants grow outside of New England, though, so this key is useful well beyond our region. What should I notice about my plant? Choose a plant that you can look at closely enough to answer some questions about its characteristics. You may want to collect all or part of the plant, or take some photos or make sketches that you can refer to later. Note the plant's location and the habitat it is growing in. How do I get started using the Simple Key? Choose the plant group you think your plant is in. To do this, compare the features of your plant with the "Key Characteristics" listed for each plant group and "Exceptions," which will help you avoid mixing up groups. Please go through the groups in the order that they appear on the page. This will help you pick the right group by eliminating wrong ones first. When you've found the group your plant belongs to, press "My plant is in this group." It's a set of plants that share some common traits that would cause many people to think of them as similar. For example, the Aquatic Plant group contains many species of plants that live in or near water. We have defined our groups as handy, contrasting categories that are easy to tell apart. They are not strict scientific classifications. A few plant species belong to more than one group in our system, but most have been assigned to a single group with the characteristics that match them best. Once I select a group, what happens next? Next, choose which subgroup your plant belongs to. For example, if your plant is woody like a tree, you'll be asked if it is a needle-leaved plant or a broad-leaved plant. Please go through the subgroups in the order that they appear on the page. This will help you pick the right group by eliminating wrong ones first. When you've found the subgroup your plant belongs to, click "My plant is in this subgroup." If your plant doesn't fit any of the subgroups, click the "Go back one level" button to choose a new group. Once you're familiar with the groups and subgroups, use the Plant Map on the left side of the page to jump directly to the subgroup your plant is in. I've chosen my plant subgroup. What's next? On the left side of the new page is a list of questions to help you narrow your matching species. Pick any question and a box will open in the center of the page. In the box, select the answer that most closely matches your plant and press the Apply Selection button. If you're not sure which selection to make, it's fine to move on without making a selection. Press the Get More Questions button to add a few new questions, added in order of their potential helpfulness in narrowing down your matching species. If you can only observe part of a plant, say the leaves, you can press Get More Questions, then check the "leaves" check box and press the second Get More Questions button, and you'll only get new choices about leaves. 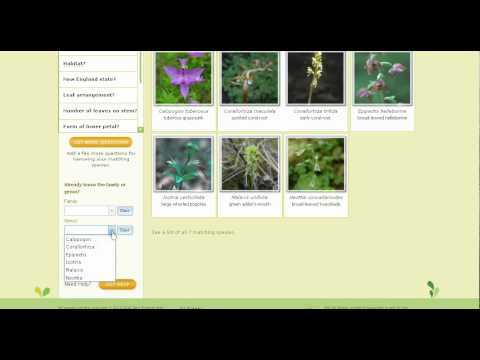 View a set of thumbnail photos of all the possible plants that match your selections, listed in alphabetical order by scientific name. Click on a photo to get a pop-up box with more information about a plant. If you decide that this is your plant, or want to read more about it in order to decide, press the Get More Info button to go to the full information page for that species. The set of thumbnail photos gets smaller as pick additional questions and answer them, honing in on your plant by a process of elimination. To clear an answer you've previously made, click the Clear link for the question in the list at left.